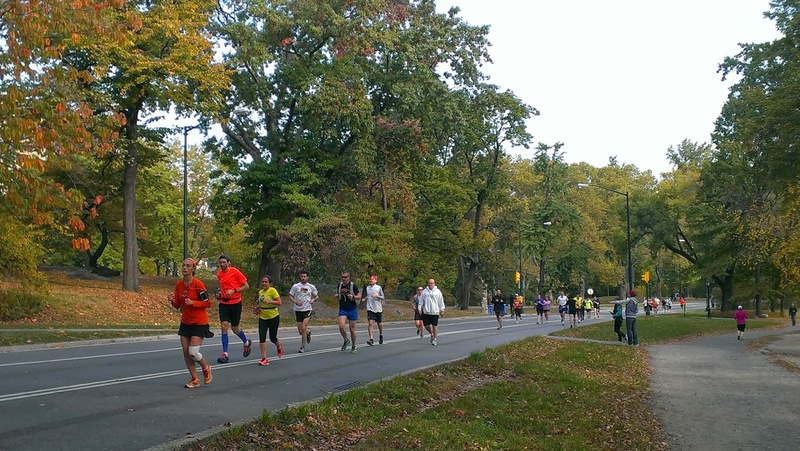 New York's Central Park is synonymous with running. Over the years, countless TV and movie characters have jogged around its many paths and of course it's where the world's largest marathon finishes every first Sunday in November. So, heading to New York this past weekend for a short break, I couldn't wait to pull on my trainers and go for a run in the world's most famous and iconic park. After arriving into JFK airport late on Thursday night, jet lag had me up early on Friday morning, absolutely raring to go for a run after a couple of days of inactivity. Despite being mid-October, the city had been experiencing a spell of unseasonably warm weather, so I headed out in short sleeves and shorts and ran the short distance from our hotel on the Upper Westside of Manhattan, across several blocks and into the park. I understood immediately why Central Park is so popular for running: it is virtually impossible to traverse the city's grid-like road structure at any kind of speed due to all the traffic and junctions. Once safely within the confines of Central Park, I stretched my legs, got up to 7:30 minute mile pace and followed the park's main path. The path, lined with trees turning from green to brown, was teeming with runners of all ages and abilities, more than I've ever seen outside of an organised race. Though some wore the latest technical clothing, and others shuffled along in old tracksuits owned since the first jogging boom of the 1970s, the uniform for most runners was the finisher t-shirt earned from a previous New York Marathon. I saw finisher t-shirts in all kinds of colours, their dates ranging from the early '90s right through to when the event was last held in 2011. New Yorkers are clearly proud of their marathon and want the world to know it. I followed the main path's undulations and understood why the marathon's hilly finish catches many runners by surprise. Though none of the inclines are particularly steep and are always followed by a corresponding downhill section, I could see why they might feel like Everest come miles 25 or 26 of a marathon. After a couple of miles on the main path, I ran a short distance on the reservoir running track, which I recognised from numerous movie scenes. 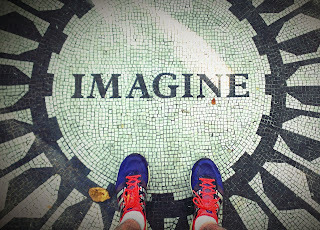 After taking in the views of the buildings further down Manhattan, I ran the short distance to the John Lennon memorial in Strawberry Fields and, following a short break to listen to a man playing Norwegian Wood on slide guitar, headed back to my hotel via Central Park West. Central Park is a brilliant, if slightly congested, venue for running. It's an extremely attractive public space and is full of buzz and energy. Though I'm sure that the novelty would quickly wear off if I had to rely upon it for my daily training, it is hard not to be inspired by so many runners all together in one place, working towards the same goal of improving their health and fitness. The New York Marathon is definitely on my radar, so hopefully my recce of the park's hills will stand me in good stead should I eventually return to run it. Let's just hope that I've managed to burn off all of the extra calories that I consumed over the weekend first. Full details of this week's training can be found under the Tim's Training tab.